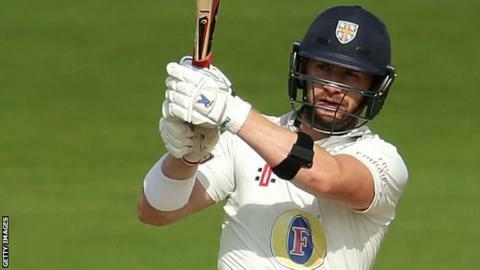 Hampshire were relegated from County Championship Division One after suffering a six-wicket home defeat by Durham in the season's final game. Lancashire's loss to Warwickshire meant Hampshire needed to win to survive. They declared on 245-9 to leave Durham 296 from a minimum of 78 overs for victory, which they reached to end the hosts' two-year stay in the top tier. Mark Stoneman (137) and Scott Borthwick (88) excelled in their last innings for Durham before they join Surrey in 2017. England all-rounder Ben Stokes (23 not out) struck the winning runs for the visitors. Hampshire had opted to bat on during the morning session to extend their lead close to 300 and, with Lancashire struggling at Edgbaston, it soon became clear that only a win would be enough for survival. Ryan Pringle's 7-107 indicated that Hampshire's spinners would be their best hope of success, but a second-wicket stand of 162 between Stoneman and Borthwick ended their chances of achieving safety.